It’s not so strange for me to be writing about leftovers. I have always believed in avoiding food waste, and efficient use of leftovers is a step in that direction. I’ll keep writing about using my leftovers here just in case there is a teeny chance that one of you might need some help in figuring out what to do with yours. Not so strange either for me to be writing about it now — getting our new home in shape is leaving me less time to play in the kitchen (the saga continues…now I am caught between two plumbers! ), hence having only enough time to grab those leftovers from the fridge for a quick meal. I’m not complaining though because, as I’ve maintained before, leftovers need not be tired or boring. This is a hearty, stick-to-your-gut meal that will fuel you through even the most trying rounds of intense clean up. Yes, including looking through 4 years worth of debris accumulated by a little rat who never throws anything away…including 4 year old credit card receipts and pay slips from her first job (I plead oh so very guilty)! Anyway, back to the dish at hand. I had made a big batch of chili for a potluck barbecue and had lots left over. I am hoping that this does not reflect on my chili-making abilities but instead on the amount of food served on said occasion. In any case, C was quite pleased that we had leftovers because that boy does love his chili. But unless you are C, one can only eat so much chili, in exactly the same way, day after day. What I’ve done here is simple: For each serving take a cup of chili (or half, or anywhere in between…depends on what you would be comfortable calling “one serving”) and place in a ramekin, clay crock, or any oven-proof single serve dish. Make a slight indentation where you want your egg to sit and crack the egg into it. Shave some cheese onto the chili (I used gruyere because that is what I had on hand but feel free to use any cheese you think might work here). Place the whole affair into a pre-heated 180C oven and bake until the egg white is set but the yolk is still jiggly. I overshot that mark (hence the overdone yolk) so make sure to keep an eye on your eggs as all ovens (and eggs!) are different. Remove from the oven, garnish with cilantro and enjoy immediately with some warm tortillas or bread, or even rice! I hope this goes a little way towards moving some of us to make the most of our leftovers…every bit helps in our efforts to avoid food waste! oh that looks yummy!! Huevos Rancheros style. Thank you. I personally LOVE leftovers. Especially when there's creative ways to us them. This sounds delicious! Really Joey I think there are some dishes that are made so we have leftovers:0) chili is one I always make too much of because it's so good so many ways. I just wanted to drop a note to say I love your blog!I read you everyday and you inspire me to cook and write about cooking! I am a NEW food blogger and I am not sure the protocol on these kinds of things, but I am going to add you to my blogroll because I read you everyday. Anyway, please let me know if you do not want me to place you on my blogroll. Thank you! But that chili looks really really good. Like super dark red and full of flavor and spice. Where's the recipe, I want it! I took one look at the picture and immediately thought: OMG, she's made huevos rancheros! Hi Tanna! So true! Chili is definitely something to make extra servings of! Adobo, our Filipino national dish, is another such food! Hi Nick! My chili still doesn’t have a fixed recipe…although I am slowly documenting it so I can share it over here! And this is soo good! I know I will borrow this idea very soon. oh how georgeous it is! 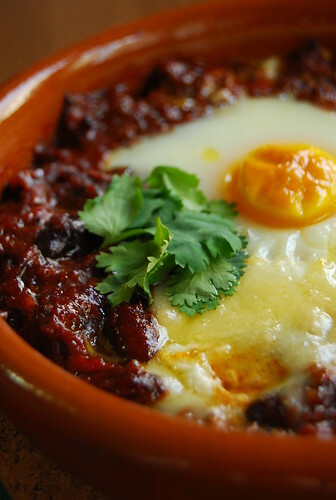 I like the sound of chili baked with an egg! Being able to make use of leftovers show creativity and some of them like chili taste better when they are a leftover. Hi Veron! That is so true…chili is better if it sits a while…just like adobo! Hi Gary! Thanks! The chili doesn’t have a fixed recipe yet…still a work in progress! Wow that looks delicious. We're trying egg on lots of things lately. Just adds so much to a dish somehow.